Olympic Gold – 1999 Zin Rules! This weekend a few of the winos gathered to celebrate the athletes and events of the 2014 Winter Olympics. With temperatures in the 70s in California and 60s in Sochi it just did not feel like winter, and the slushy snow and tourists in short sleeves confirmed that. What happened to the ushankas (Russian fur hats)? Starting off a bit unenthusiastically, have no fear, once the wine bottles were opened the group fully enjoyed the grace and skill of the ice skating competition taking place in the background. The plan was to focus on red wines, in no particular order, and enjoy some appetizers typical of different countries – spanakopita, empanadas, meatballs, tomato-basil crostini and a large platter of charcuterie. 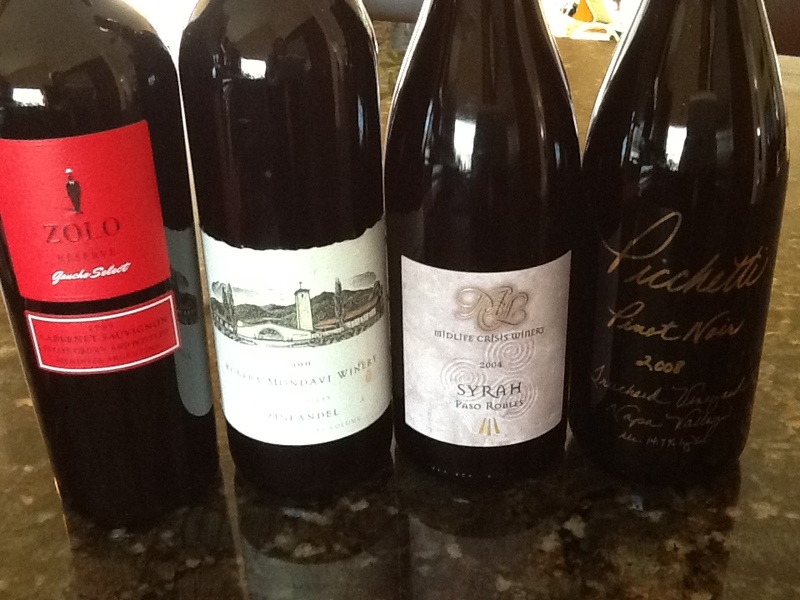 The top four, we could not agree on three, included some very diverse wines. 1999 Zinfandel, Robert Mondavi Winery in Napa Valley: Bold, red color and complex cherry and spices aromatics. This was a pleasant surprise for the Zinfandel novices in the group and the overall winner. 2004 Syrah, Midlife Crisis Winery in Paso Robles: This winery closed in 2009 with only 800 total cases produced. It was the short-lived dream of a Hollywood couple who bottled their first wines in 2004, a total of 80 cases. The wine was very smooth and easy to drink. The fact that we would probably never have it again, and the name, gave it an extra edge. 2008 Pinot Noir, Pichetti Trouchard Vineyard in Napa Valley: A favorite winery of one of the weekend winos, we can always count on them to bring a bottle from Pichetti. Fruity and spicy the French barrel oak comes through. 2009 Cabernet Sauvignon Reserve, Zolo Gaucho Select from Mendoza: Yes, this was a Cabernet, not a Malbec and it was rich with hints of chocolate and black berries. Perfect with the meat empanadas and something I will buy for my next steak dinner. Only one person in the group had been to Russia, some questioned the politics and leadership, but we all agreed that the history, art and the vodka would all be good reasons to visit some day. Wine in Russia? We’ll have to look into that! Categories: Events, Wine | Tags: Cabernet Sauvignon, malbec, midlife crisis, Pichetti, Pinot Noir, robert mondavi, wine, Wine tasting, zinfandel, zolo | Permalink.